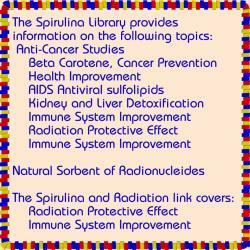 Nutrition Pure and Simple Blog: Spirulina | Coping with radiation in daily living. 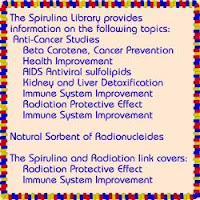 Spirulina | Coping with radiation in daily living. Many people have concerns about radiation. News about radiation from Japan's nuclear reactor deepens this concern. You may be unnecessarily worried. This paper discusses ionizing and non-ionizing radiation. We present useful nutritional information to help you cope with small and large exposures of radiation. Ionizing radiation consists of particles or electromagnetic waves that are energetic enough to detach electrons from atoms or molecules, thus ionizing them. Its effect is mutagenic. Ionizing radiation is used in medical applications. Natural background radiation of both types is present everywhere. Some radiation you ignore. Cell phones, microwave ovens, smoking and food are examples. Some radiation exposure can cause potential problems. CAT scans and other radiographic studies, mammograms, dental and bone scan tests are common. Airport body scanners are a hazard for frequent fliers. These sources, both ionizing and non-ionizing, have the potential of being a greater problem as the incidence and proximity of exposure increases. In other words, you have more likelihood of damage from daily living exposure than from a nuclear disaster accident. If you are very old, very young or in poor health you are most at risk from radiation. Pregnant mothers risk their babies. Problems from exposure to radiation vary according to the your health. So what can you do? Stay as healthy as you possibly can . Here is a Nutritional approach to minimize damage from radiation exposure. The simple thing to do is follow my Basic Protocol. It has been developed to supply the optimal nutrients needed by the body on a daily basis. Ultra Vites - I Formulated this Multi to provide a high level of readily available minerals as well as B Vitamins and antioxidants. It is designed to keep the body well mineralized. This presents less opportunity for radioactive minerals to be absorbed. Note: Ultra-Preventive Multi Vitamin Mineral combines all the features of Ultra Vites, plus it includes 1.1 grams of Spirulina. See #5 for more information on Spirulina. Ultra Omega-Linic - I designed this essential fatty acid product for its anti inflammatory properties. It supplies the fatty acids necessary to keep cell membranes functional. Essential because the body cannot make them - they MUST be supplied. Our Wild Salmon oil is from the protected waters of Alaskan fisheries and are assayed for heavy metals and toxins and radiation. Extra Calcium (Calcium D Chelate) keeps optimal calcium levels in the bones, thus protecting them from the uptake of radioactive ions. Argiletz French Green Illite Clay is the only one that has been approved for food use by the French National Health Superior Counsel for internal use. Its main properties are that it is Adsorbent, Absorbent, Purifying and Calming. Green clays are curative volcanic ashes that detoxify and restore mineral balance. This Illite clay contains only natural materials treated mechanically without any chemical additives. As a bacteria-destroying agent it can render contaminated water innocuous. When ingested, it travels along the digestive tract eliminating toxic agents and harmful bacteria. PhytoGreen Drink powder uses Organic Earthrise™ Spirulina. Earthrise™ Spirulina studies on the children exposed after the Chernoble accident showed a 50% decrease in radioactive elements. Spirulina also stimulates recovery of white blood cells and bone marrow counts. Spirulina Caps - each 6 capsules provide 3.24 g Spirulina Natural® Earthrise™ Spirulina. Dr Jones is the Nutritional Consultant for Nutrition Pure and Simple. Nutrition Pure and Simple is a web based company with a shopping cart. We work closely with Dr Jones’ newly updated site, www.jjconsulting.net which has articles, gluten-free and low carbohydrate recipes, Dr Jones’ protocols and much new product information. You can to download pdf files that include the protocols and product information, as well as the catalog.